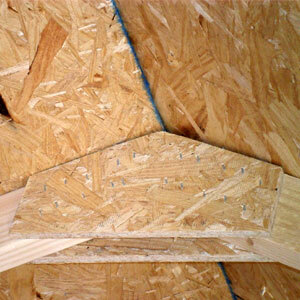 7/16 OSB STAPLED GUSSETS ON TRUSSES. 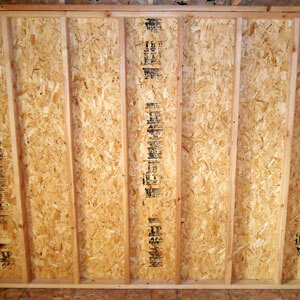 TRUSSES TRIPLE NAILED TO DOUBLE ‘TOP PLATE’ OF WALLS. 24” oc 2 x 4 walls on all Standard Sheds. 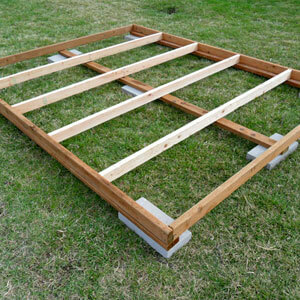 pressure treated 2 x 4's below floor joists. 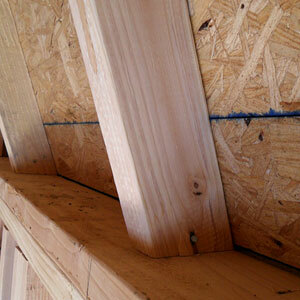 TRUSSES TRIPLE NAILED TO ‘TOP PLATE’ OF WALLS. 16” oc 2 x 4 walls on all Tall Barns and Deluxe Ranch Sheds. 30 YEAR SHINGLES ON ALL ROOFS.